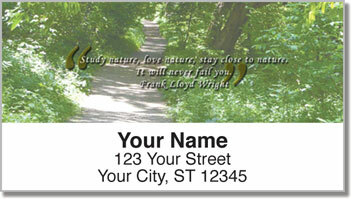 This unique collection of address labels brings into sharp focus the words of four notable historic figures who took great inspiration from nature: Ralph Waldo Emerson, Albert Einstein, Saint Augustine and Frank Lloyd Wright. 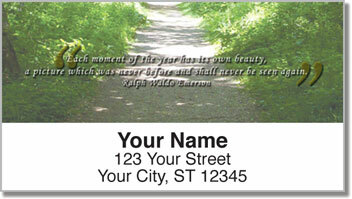 These handy, self-sticking labels are designed to save you the time and trouble of scribbling out your return address on every envelope or package you mail. 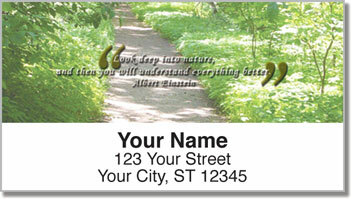 But they're great for identifying personal items, too-things like DVDs or video games, for example. 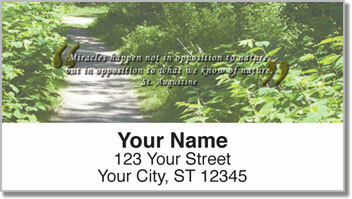 Also available as a set of matching personal checks, both products will remind you take nature's lessons seriously. Order yours today!